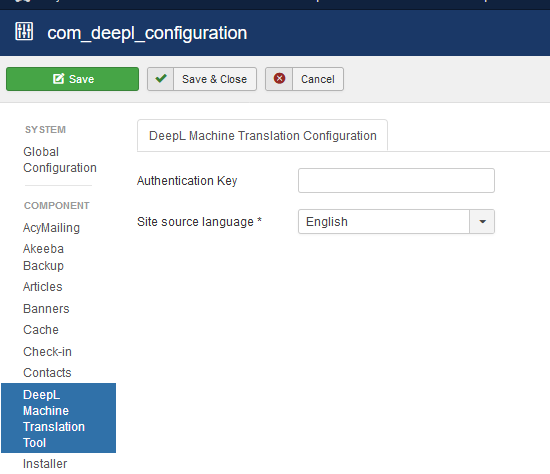 The Jomres.net DeepL component is designed to allow you to import DeepL (https://www.deepl.com/translator) machine translated content from a base language to other languages into Joomla. Before you can start using it, there are a few pre-requisites. You will need an account and an API key from DeepL. DeepL currently supports English, German, French, Spanish, Dutch, Italian, and Polish. Next you will need to ensure that your site is setup to be multilingual. Install the extra languages (of those supported by DeepL). Before you can translate any articles you need to ensure that existing articles are in your "base" language. This means that if your current articles are in English, then the language must be set to English, not All. DeepL is fast gaining a reputation for being the best automatic machine translation service. They are reasonably priced given the number of characters they allow per month and after initial setup, unless you're adding more than a million characters per month to your site their basic 20€ pcm subscription is likely all you'll need to pay. To start off with, when initially translating your existing content, if you have a large site then it's possible that you will exceed their 1,000,000 character limit. That's no big deal, you'll simply be charged more, and the prices aren't too bad. After the initial setup phase however this will settle down and you're unlikely to hit this limit again. The list of languages they offer is pretty limited. If you need more languages then another service might be worth considering. This component is not an "all singing, all dancing" multilanguage translation tool for Joomla. It doesn't aim to be another Falang, and for good reason. Joomla's multilanguage handling is already excellent, and with the introduction of multilanguage associations, it manages almost everything with great ease. The one thing it doesn't do however is provide automatic translation of content, and that's where this component comes in. It looks at your site for your source content, lists all of those articles, and offers you a button to use to trigger the automatic translation. This means that you'll never go over your DeepL quota unknowingly, and you can choose exactly what you want translated. New translations are automatically associated with the source content. That's it, that's all it does. Nothing else. A simple to use tool to solve a complex problem, use Joomla for everything else. Installation is the same as any other Joomla component. Save your API key and the article source language. Only articles of that language will be listed in the DeepL component page. On this page you will see a list of all articles that are set to the base language. Articles with a green background have already been translated. Those with a yellow background have not. To translate an article click the Translate and View Article(s) button. 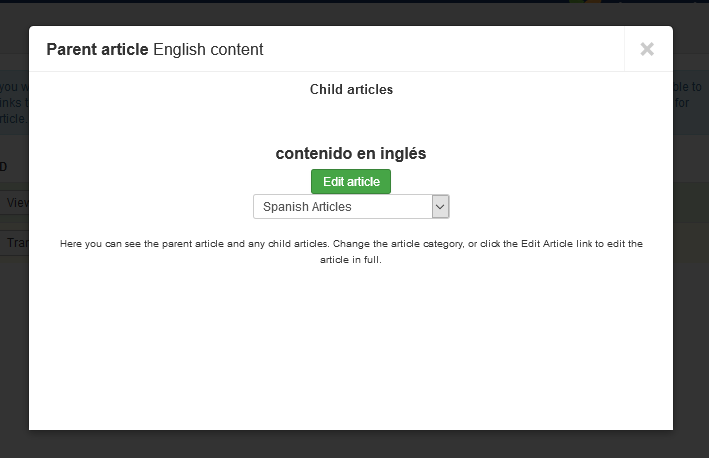 When you click the button the component will automatically translate the articles, then open a modal with a list of the child articles. From this page you can see the child articles, change the category of those articles, and click a button that will take you to the full article edit screen. If you have a support license, please contact me via https://tickets.jomres.net for support. The component has been designed with extensibility in mind, however it's likely that further work will be required to allow the component to work with other Joomla components. If you are a Joomla component developer with plugins already listed on the JED please contact me via the ticket system for a copy of the component.